Greenfield’s Serenity McNair dribbles through a sea of Ridgecroft defenders in Wednesday’s game at Greenfield’s Forbes Field. She scored five goals to lead the Lady Knights to a 9-0 win. Greenfield's Caroline Stone (4) heads a ball during the first half of their contest against Ridgecroft on Wednesday which the Lady Knights won 9-0. Stone had an assist. Greenfield's Anna Beddingfield (22) kicks the ball as a Ridgecroft defender tries to stop her in Wednesday's game. Beddingfield scored her first goal of the season and picked up an assist in the 9-0 win. Greenfield’s Margaret Covington (2) makes a pass to team captain Kaelyn Wall in Wednesday’s 9-0 victory over Ridgecroft. Wall scored three goals while Covington assisted on two goals. Greenfield School spectators got used to watching seventh-grader Serenity McNair and junior Kaelyn Wall put on a show on the basketball court -this winter, but, now it seems, the show has been picked up for another season. 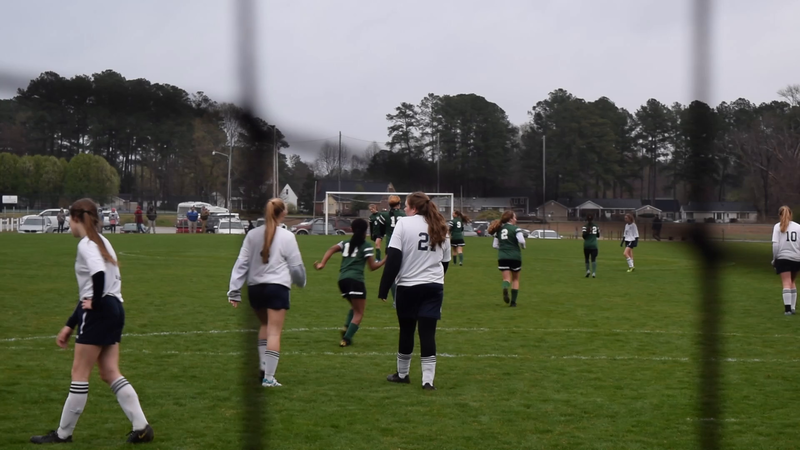 McNair and Wall combined for eight goals in the Greenfield girls soccer team’s 9-0 win over Ridgecroft of Ahoskie on a damp, chilly Wednesday evening. In the Lady Knights’ second game in as many days, McNair put in five goals on her own, including the first two of the game and the first three of the second half, to bring her season total to 13. 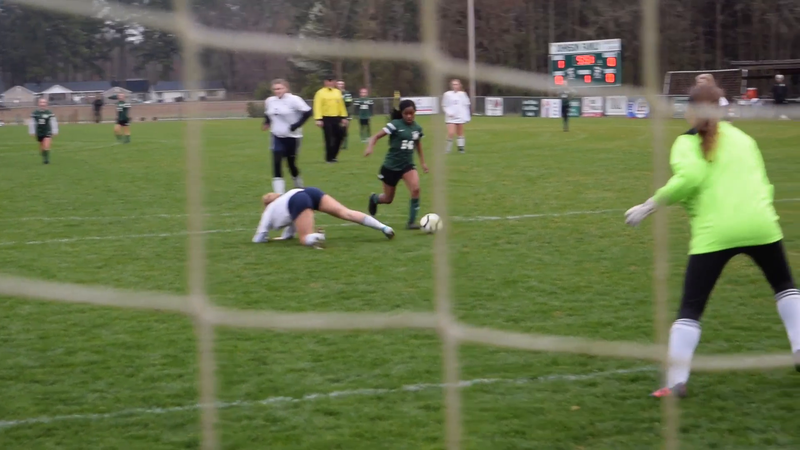 McNair asked to be pulled after the fifth goal in the 55th minute, and Wall picked up where she left off. Wall had the last goal during the first half in the 38th minute. She also scored the sixth and seventh goals in the 60th and 67th minutes, respectively, to give her the hat trick and seven on the season. The 1-A Lady Knights of the 1-A/ 2-A split Coastal Plains Independent Conference went to 4-3 on the season by the aggressive attacking offense that got three shots at the goal in the first minute. Greenfield would finish with 24 shots on goal. The Lady Rams (0-3) of the 1-A Tarheel Conference took just three shots on goal, all three saved by Greenfield goalkeeper Sumer Hassan. Eighth-grader Anna Beddingfield scored her first goal of the season in the 70th minute to end the game, which Nguyen said was a long time coming because she had other chances and wasn’t able to put it in. Beddingfield, along with Lily Hesse and Caroline Stone, also had an assist in the game. Margaret Covington finished with two assists. The Lady Knights will take the home pitch again Monday for another nonconference against Rocky Mount Academy at 6 p.m.